McQuade was caught at Mitchelston Industrial Estate. Frances McQuade, 47, from Kirkcaldy, was seen trying to conceal the drugs when officers went into the unit late at night. They had detained McQuade’s partner moments before outside the unit. 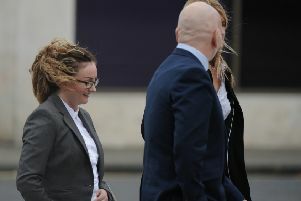 On the seventh day of a sheriff and jury trial at Dunfermline Sheriff Court, McQuade, of Dunnikier Road, admitted that on February 23 at CM Maintenance, Unit 71, Mitchelston Industrial Estate, Kirkcaldy and elsewhere, she was concerned in the supply of diamorphine. Not guilty pleas to other charges she faced were accepted. Sheriff Charles MacNair called for reports and McQuade was remanded in custody. She will be sentenced January 3.